Deliberate destruction and theft of cultural heritage has been conducted by the Islamic State of Iraq and the Levant since 2014 in Iraq, Syria, and to a lesser extent in Libya. The destruction targets various places of worship under ISIL control and ancient historical artifacts. In Iraq, between the fall of Mosul in June 2014 and February 2015, ISIL had plundered and destroyed at least 28 historical religious buildings. Valuable items from some buildings were looted in order to smuggle and sell them to foreigners to finance ISIS activities. ISIL justifies the destruction of cultural heritage sites with its following of Salafism which, according to its followers, places "great importance on establishing tawhid (monotheism)", and "eliminating shirk (polytheism)." While it is often assumed that the group's actions are mindless acts of vandalism, there is an ideological underpinning to the destruction. ISIL views its actions in sites like Palmyra and Nimrud as being in accordance with Sunni Islamic tradition. Beyond the ideological aspects of the destruction, there are other, more practical, reasons behind ISIL's destruction of historic sites. Grabbing the world's attention is easily done through the destruction of such sites, given the extensive media coverage and international condemnation that comes afterwards. Destroying historic ruins also allows ISIL to wipe the slate clean and to start afresh, leaving no traces of any previous culture or civilization, while also providing an ideal platform for the group to establish its own identity and leave its mark on history. Despite the images showing extreme destruction, ISIL has also been making use of the looted antiquities to finance their activities. Despite the UN's ban on the trade of artifacts looted from Syria since 2011, the group has been smuggling these artifacts out of the Middle East and on to the underground antique markets of Europe and North America. In 2014, media reported destruction of multiple, chiefly Shiite, mosques and shrines throughout Iraq by ISIL. Among them were the Al-Qubba Husseiniya Mosque in Mosul, Sheikh Jawad Al-Sadiq Mosque, Mosque of Arnā’ūt, Mosque of Qado, Mosque of Askar e- Mullah and Saad Bin Aqeel Shrine in Tal Afar, Sufi Ahmed al-Rifai Shrine and tomb and Sheikh Ibrahim shrine in Mahlabiya District and the so-called Tomb of the Girl (Qabr al-Bint) in Mosul. The Tomb of the Girl, reputed to honour a girl who died of a broken heart, was actually believed to be the tomb of medieval scholar Ali ibn al-Athir. On 24 September 2014, the Arba'een Wali Mosque and Shrine in Tikrit, containing forty tombs from the Umar era, was blown up. On 26 February 2015 ISIL blew up the 12th century Green Mosque in central Mosul. In Mosul, ISIL also targeted several tombs with shrines built over them. In July 2014, ISIL destroyed one of the tombs of prophet Daniel (located in Mosul) by planted explosives. On 24 July 2014, the tomb and mosque of the prophet Jonah was destroyed with explosives. On 27 July, ISIL destroyed the tomb of Prophet Jirjis (George). On 25 July 2014, the 13th-century shrine of Imam Awn al-Din in Mosul, one of the few structures to have survived the 13th-century Mongol invasion, was destroyed by ISIL. The destruction was mostly carried out with explosive devices, but in some cases bulldozers were used. In March 2015, ISIL reportedly bulldozed to the ground the Hamu Al-Qadu Mosque in Mosul, dating back to 1880. The Hamu-Al-Qadu mosque contained an earlier tomb of Ala-al-din Ibn Abdul Qadir Gilani. In the same year ISIL ordered the removal of all decorative elements and frescoes from mosques in Mosul, even those containing Quranic verses that mention Allah. They were regarded by ISIL as "an erroneous form of creativity, contradicting the basics of sharia." At least one imam in Mosul opposing that order was shot to death. Leaning minaret of the Great Mosque of Al-nuri. Destroyed by ISIL on 22 June 2017 during the Battle of Mosul. In 2016, ISIL destroyed the Minaret of Anah located in Al Anbar Province, which dates back to the Abbasid era. The minaret was only rebuilt in 2013 after the destruction by an unknown perpetrator in 2006. In 2017, ISIL destroyed the Great Mosque of al-Nuri and its leaning minaret. This was the mosque where ISIL leader Abu Bakr al-Baghdadi declared the establishment of the Islamic State caliphate three years prior. In June 2014, it was reported that ISIL elements had been instructed to destroy all churches in Mosul. Since then, most churches within the city have been destroyed. Dair Mar Elia, the oldest monastery in Iraq, was demolished sometime between late August and September 2014. The destruction went unreported until January 2016. The Al-Tahera Church, built in the early 20th century, was possibly blown up in early February 2015. However, there is no evidence that the church was actually destroyed. As of 5 April 2015[update], ISIL destroyed the Assyrian Christian Virgin Mary Church on Easter Sunday in the Syrian town of Tel Nasri. "As the 'joint forces' of Kurdish People's Protection Units and local Assyrian fighters attempted to enter the town", ISIL set off the explosives destroying what remained of the church. ISIL had controlled the church since 7 March 2015. In May 2014, ISIL members smashed a 3,000-year-old neo-Assyrian statue from Tel Ajaja. Later reports indicated that over 40% of the artifacts at Tel Ajaja (Saddikanni) were looted by ISIS. In the Syrian city of Raqqa, ISIL publicly ordered the bulldozing of a colossal ancient Assyrian gateway lion sculpture from the 8th century BC. Another lion statue was also destroyed. Both statues originated from the Arslan Tash archaeological site. The destruction was published in the ISIL magazine, Dabiq. Among the lost statues are those of Mulla Uthman al-Mawsili, of a woman carrying an urn, and of Abu Tammam. On 26 February 2015, ISIL released a video showing the destruction of various ancient artifacts in the Mosul Museum. The affected artifacts originate from the Assyrian era and from the ancient city of Hatra. The video in particular shows the defacement of a granite lamassu statue from the right side of the Nergal Gate by a jackhammer. The statue remained buried until 1941 when heavy rains eroded the soil around the gate and exposed two statues on both sides. Several other defaced items in the museum were claimed to be copies, but this was later rebutted by Iraq's Minister of Culture, Adel Sharshab who said: "Mosul Museum had many ancient artifacts, big and small. None of them were transported to the National Museum of Iraq in Baghdad. Thus, all artifacts destroyed in Mosul are original except for four pieces that were made of gypsum". On 7 March 2015, Kurdish sources reported that ISIL had begun the bulldozing of Hatra, which has been under threat of demolition after ISIL had occupied the adjacent area. The next day ISIL sacked Dur-Sharrukin, according to a Kurdish official from Mosul, Saeed Mamuzini. In 2015 the face of the Winged Bull of Nineveh was damaged. Following the capture of Palmyra in Syria, ISIL was reported as not intending to demolish the city's World Heritage Site (while still intending to destroy any statues deemed 'polytheistic'). On 27 May 2015, ISIL released an 87-second video showing parts of the apparently undamaged ancient colonnades, the Temple of Bel and the Roman theatre. On 27 June 2015, however, ISIL demolished the ancient Lion of Al-lāt statue in Palmyra. Several other statues from Palmyra reportedly confiscated from a smuggler were also destroyed by ISIL. On 23 August 2015, it was reported that ISIL had blown up the 1st-century Temple of Baalshamin. On 30 August 2015, ISIL demolished the Temple of Bel with explosives. Satellite imagery of the site taken shortly after showed almost nothing remained. According to the report issued on September 3, 2015 by ASOR Syrian Heritage initiative, ISIL also destroyed seven ancient tower tombs in Palmyra since the end of June over two phases. The last phase of destruction occurred between August 27 and September 2, 2015, including the destruction of the 2nd-century AD Tower of Elahbel, called "the most prominent example of Palmyra's distinct funerary monuments". Earlier, the ancient tombs of Iamliku and Atenaten were also destroyed. The Monumental Arch was also blown up in October. ISIL has also looted and demolished the Parthian/Roman city of Dura-Europos in east of Syria. Nicknamed "the Pompeii of the desert", the city was of particular archaeological significance. It was reported on 1 January 2019 that Syrian authorities recovered two Roman-era funerary busts smuggled from Palmyra from an abandoned ISIL site in the al-Suknah countryside. Hatra (Arabic: الحضر al-Ḥaḍr) was an ancient city in the Ninawa Governorate and al-Jazira region of Iraq. A large fortified city and capital of the first Arab Kingdom, Hatra withstood invasions by the Romans in A.D. 116 and 198 thanks to its high, thick walls reinforced by towers. However about 240 ce, the city fell to Shāpūr I (reigned c. 240–272), the ruler of the Persian Sāsānian dynasty, and was destroyed. The remains of the city, especially the temples where Hellenistic and Roman architecture blend with Eastern decorative features, attest to the greatness of its civilization. The city lies 290 km (180 mi) northwest of Baghdad and 110 km (68 mi) southwest of Mosul. On 7 March 2015, various sources including Iraqi officials reported that the militant group Islamic State of Iraq and the Levant (ISIL) had begun demolishing the ruins of Hatra. Video released by ISIL the next month showed destruction of the monuments. The ancient city was recaptured by the Popular Mobilization Forces on 26 April 2017. The general director of the Czech National Museum, Michal Lukeš, signed an agreement in June 2017 committing the institution to help Syria save, preserve and conserve much of its cultural and historical heritage damaged by war, including the ancient site of Palmyra; he met with Maamoun Abdulkarim and discussed plans for the works that are said to last until 2019. In June 2017, The World Monuments Fund (WMF) announced launching a £500,000 scheme to train Syrian refugees near the Syrian-Jordanian border in traditional stone masonry. The aim is teaching them to develop skills necessary to be able to help in restoring cultural heritage sites that have been damaged or destroyed during the Syrian Civil War once peace is restored to Syria. Minor restorations have already begun: Palmyrene funerary busts of a deceased man and a woman, damaged and defaced by ISIL, were taken from Palmyra, then to Beirut to be sent off to Rome. Italian experts restored the portraits using 3D technology to print resin prosthetics, which were coated with a thick layer of stone dust to blend in with the original stone; the prosthetics were attached to the damaged faces of the busts using strong magnets. The restored pieces are now back in Syria. Abdulkarim said the restoration of the busts "is the first real, visible positive step that the international community has taken to protect Syrian heritage". ^ a b c d Khalid al-Taie (13 February 2015). "Iraq churches, mosques under ISIS attack". mawtani.al-shorfa.com. Archived from the original on 19 February 2015. ^ "Don't Be Surprised by ISIS Destroying History". Tony Blair Faith Foundation. ^ Martin Chulov. "How an arrest in Iraq revealed Isis's $2bn jihadist network". The Guardian. ^ "U.N. Security Council ups pressure on Islamic State financing". Reuters UK. ^ "Why Does ISIS Destroy Historic Sites?". Tony Blair Faith Foundation. Archived from the original on 2015-10-06. ^ a b c "ISIS Destroys Shiite Mosques And Shrines In Iraq, Dangerously Fracturing Country (PHOTOS)". The Huffington Post. 7 July 2014. Retrieved 27 February 2015. ^ Praveen Swami (29 June 2014). "ISIS insurgents wage war on history". The Hindu. Retrieved 27 February 2015. ^ "ISIL destroys two Shia religious sites in Iraqi city of Mosul". PressTV. 25 June 2014. Retrieved 28 February 2015. ^ Abdelhak Mamoun (25 September 2014). "URGENT: ISIS destroys historical Al-Arbain mosque in Tikrit". Iraqi News. Retrieved 27 February 2015. ^ a b c d e "Ancient artefacts destroyed in Iraq". News.com.au. 27 February 2014. Retrieved 28 February 2015. ^ Hafiz, Yasmine (25 July 2014). "ISIS Destroys Jonah's Tomb In Mosul, Iraq, As Militant Violence Continues". The Huffington Post. Retrieved 28 July 2014. ^ "ISIL destroys Mosque of Biblical Jonah, Prophet Yunus". IraqiNews.com. 24 July 2014. Retrieved 24 July 2014. ^ "Islamic State destroys ancient Mosul mosque, the third in a week". theguardian.com. 27 July 2014. Retrieved 27 July 2014. ^ "ISIL Destroys Another Mosque in Iraq". Sputnik. 8 March 2015. Retrieved 10 March 2015. ^ a b ""Исламское государство" заставило имамов Мосула удалять фрески со стен мечетей" (in Russian). Russian News Agency "TASS". 2 April 2015. Retrieved 22 May 2015. ^ Thornhill, Ted (10 March 2015). "ISIS continues its desecration of the Middle East: Islamic State reduces Sufi shrines in Libya to rubble in latest act of mindless destruction". Daily Mail. Retrieved 12 March 2015. ^ Hall, John (23 June 2015). "ISIS begin the destruction of Palmyra: Islamic extremists blow up two mausoleums in the ancient Syrian city... including one belonging to a descendant of the Prophet Mohammed". Daily Mail. Retrieved 24 June 2015. ^ السياحة والآثار تفتتح مئذنة "عنه" في الأنبار بعد ترميمها Archived 2018-02-22 at the Wayback Machine. Al-Mada Newspaper. Retrieved December 29, 2017. ^ داعش يفجر قلعة عنه الاثرية Archived 2017-12-29 at the Wayback Machine. Al-Garbiya. Retrieved December 29, 2017. ^ "Battle for Mosul: IS 'blows up' al-Nuri mosque". BBC. 21 June 2017. Retrieved 21 June 2017. ^ "ISIL orders destruction of all churches in Mosul". Iraqi News. 16 June 2014. Retrieved 28 February 2015. ^ Abdelhak Mamoun (26 July 2014). "URGENT: ISIL destroys the Virgin Mary church in Mosul". Iraqi News. Retrieved 28 February 2015. ^ Mendoza, Martha; Alleruzzo, Maya; Janssen, Bram (20 January 2016). "IS Destroys Religious Sites: The oldest Christian monastery in Iraq has been reduced to a field of rubble by IS's relentless destruction of ancient cultural sites". U.S. News & World Report. Associated Press. Archived from the original on 21 January 2016. ^ "Iraq's oldest Christian monastery destroyed by Islamic State". BBC. 20 January 2016. Archived from the original on 20 January 2016. ^ "There is no evidence that the al-Tahera Church (of the Immaculate/Virgin Mary) in Mosul has been destroyed (yet)". conflict antiquities. 29 July 2014. Archived from the original on 27 January 2016. ^ "ISIL destroys historical church in Mosul". Worldbulletin News. 10 March 2015. Retrieved 10 March 2015. ^ Gander, Kashmira (8 July 2015). "Isis 'kills four children' as it reportedly destroys ancient church in Iraqi city of Mosul". The Independent. Retrieved 12 July 2015. ^ "ISIS extremists bomb historic church in Mosul". ARA News. 28 April 2016. Archived from the original on 1 May 2016. ^ Hayrumyan, Naira (24 September 2014). "Middle East Terror: Memory of Armenian Genocide victims targeted by ISIS militants". ArmeniaNow. ^ "IS said to destroy Armenian Genocide memorial". The Times of Israel. 22 September 2014. ^ "ISIL Destroys VII-century Church, Historical Mosque in Iraq". Alahednews. 26 September 2014. Retrieved 27 February 2015. ^ Mezzofiore, Gianluca (19 March 2015). "Isis 'blows up famed 4th-century Mar Behnam Catholic monastery' in Iraq". International Business Times. Retrieved 30 March 2016. ^ Jones, Christopher (23 June 2015). "Another Treasure Lost in Iraq: The Story of Mar Behnam Monastery". Hyperallergic. Retrieved 24 October 2016. ^ a b "ISIS blew up a Syrian church on Easter". Now Lebanon via Business Insider. 6 April 2015. Retrieved 7 April 2015. ^ "News from The Associated Press". Archived from the original on 9 November 2014. Retrieved 21 August 2015. ^ Nick Gutteridge. "Islamic State: ISIS digs up saint's bones after bulldozing Christian church in Syria". Express.co.uk. Retrieved 21 August 2015. ^ "Extremist IS militants damage ancient citadel, two shrines in Iraq's Nineveh". Xinhua News Agency. 31 December 2014. Archived from the original on 13 January 2015. ^ Jones, Christopher (15 February 2015). "ISIS destroys several more sites in Mosul and Tal Afar". Gates of Nineveh. Archived from the original on 5 March 2016. ^ Abdelhak Mamoun (28 January 2015). "ISIS detonates large parts of Nineveh historical wall". Iraqi News. Retrieved 28 February 2015. ^ Celeng, Sozbin; Yousef, Sarbaz (16 April 2016). "ISIS extremists destroy parts of Nineveh ancient wall northern Iraq". ARA News. Archived from the original on 21 April 2016. ^ a b "Threats to Cultural Heritage in Iraq and Syria". US Department of State. 23 September 2014. Retrieved 27 February 2015. ^ "Lion statues destroyed". UNESCO. Retrieved 27 February 2015. ^ John Burger (2 March 2015). "What's Been Lost to Radical Islamists' Sledgehammers". Newsmax Media. Retrieved 8 March 2015. ^ "ISIL Destroyed Original Artifacts, Not Copies — Iraqi Culture Minister". Sputnik. 12 March 2015. Retrieved 13 March 2015. ^ "'IS destruction of Nimrud' on video". TimesofMalta.com. 12 April 2015. Retrieved 12 April 2015. ^ Yacoub, Sameer N. (7 March 2015). "IS destroying another ancient archaeological site in Iraq". ArmyTimes. USA. Associated Press. Retrieved 7 March 2015. ^ "Islamic state 'demolish' ancient Hatra site in Iraq". BBC. 7 March 2015. Retrieved 15 August 2015. ^ a b "Ancient site Khorsabad attacked by Islamic State: reports". Toronto Star. 8 March 2015. Retrieved 8 March 2015. ^ "Боевики "Исламского государства" взорвали древний замок Баш Тапия в иракском Мосуле" (in Russian). Russian News Agency "TASS". 8 April 2015. Retrieved 22 May 2015. ^ a b "Islamic State militants 'destroy Palmyra statues'". BBC. 2 July 2015. Retrieved 3 July 2015. ^ "Museum of Lost Objects: The Winged Bull of Nineveh - BBC News". BBC News. Retrieved 2016-03-01. ^ a b "Syria: Isis releases footage of Palmyra ruins intact and 'will not destroy them'". The Guardian. Retrieved 29 May 2015. 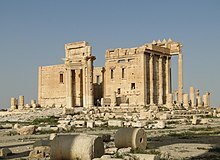 ^ Isis 'blows up temple dating back to 17AD' in Syrian city of Palmyra, TheGuardian.com; accessed 25 August 2015. ^ "Palmyra's Temple of Bel 'destroyed'". BBC News. BBC. Retrieved 31 August 2015. ^ a b c "In latest round of destruction, ISIL reduces three ancient tower tombs in Palmyra to rubble". National Post. September 4, 2015. Retrieved September 4, 2015. ^ Shaheen, Kareem (5 October 2015). "Isis blows up Arch of Triumph in 2,000-year-old city of Palmyra". The Guardian. Retrieved 5 October 2015. ^ "We're sorry, that page can't be found". www.state.gov. Retrieved 23 June 2017. ^ "IS continues cultural cleansing of Iraq with Hatra's destruction: UNESCO". 8 March 2015. Retrieved 23 June 2017. ^ "Video: Islamic State group shot, hammered away Iraq's Hatra". Retrieved 23 June 2017. ^ "IS conflict: Iraqi force 'retakes ancient city of Hatra'". 26 April 2017. Retrieved 23 June 2017 – via www.bbc.co.uk. ^ Varghese, Johnlee. "Isis Burns Down Mosul Library, Destroys 8,000 Rare Books and Manuscripts". Retrieved 23 June 2017. ^ London, Margaret Coker in; Baghdad, Ben Kesling in (2016-04-01). "Islamic State Hijacks Mosul University Chemistry Lab for Making Bombs". Wall Street Journal. ISSN 0099-9660. Retrieved 2017-01-28. ^ "Reinforce the immunity of our common heritage under threat". UNESCO. 21 December 2014. Retrieved 27 February 2015. ^ "Nimrud: Outcry as IS bulldozers attack ancient Iraq site". BBC News. 6 March 2015. Retrieved 6 March 2015. ^ Resolution 69/281, un.org; accessed 15 August 2015. ^ Sean Higgins. "Oxford Deploying 5,000 Modified 3D Cameras to Fight ISIS". sparpointgroup.com. ^ Sputnik (2 September 2015). "Protecting History: The Digital Project Preserving Artifacts From ISIL Ruin". sputniknews.com. ^ "The digital race against IS". BBC Radio 4 "Today" programme. BBC. 28 August 2015. Retrieved 24 September 2015. ^ Rosenfield, Karissa (1 September 2015). "Harvard and Oxford Take On ISIS with Digital Preservation Campaign". Arch Daily. Retrieved 24 September 2015. ^ Mackay, Mairi (31 August 2015). "Indiana Jones with a 3-D camera? Hi-tech fight to save antiquities from ISIS". CNN. Retrieved 24 September 2015. ^ Alanna Martinez. "Can 3-D Imaging Save Ancient Art from ISIS?". Observer. ^ "Scientists to flood Middle East with 1,000s of 3D cameras to 'save' ancient sites from ISIS". RT English. ^ Martin, Guy (31 August 2015). "How England's Institute Of Digital Archeology Will Preserve The Art Isis Wants to Destroy". Forbes. Retrieved 24 September 2015. ^ Johnstone, Chris (17 May 2017). "Czechs sign up to help save Syrian cultural heritage". Radio Praha. Retrieved 24 June 2017. ^ Shaw, Anny (21 June 2017). "Syrian refugees to be trained to rebuild Palmyra and other heritage sites". The Art Newspaper. Archived from the original on 2017-06-24. Retrieved 24 June 2017. ^ a b c d Squires, Nick (16 February 2017). "Stone sculptures smashed by Isil in ancient city of Palmyra restored to former glory by Italian experts". Telegraph.co.uk. Retrieved 24 June 2017. ^ a b Di Donato, Valentine; Said-Moorhouse, Lauren (17 February 2017). "Palmyra treasures restored after ISIS hammer attack". CNN. Retrieved 24 June 2017. This page was last edited on 16 April 2019, at 06:22 (UTC).